Beyond Expectations!! Before you get your hopes too high, let me quickly clarify that we went there with little expectation. What could be very nice, we thought, about a small Mexican city 60 miles from the US border. Little did we know that it would turn out to be one of the most relaxing and fun holidays we ever had without a lot of planning involved! Known as "Puerto Penasco" in Spanish and "Rocky Point" in English, it is nicknamed as "Arizona's beach" as it is the closest beach to major cities in AZ including Phoenix and Tuscon. It does not have turquoise blue waters or coral pink sands but it does have an interesting tidal phenomenon especially during new moon or full moon days. We happened to go there on a full moon day, luckily for us, and witnessed the high tides in the afternoon (absolutely loved them!) and the water receding by more than 200 meters when we got up the next day morning, leaving exposed a new tract of land covered with numerous sea shells and tiny marine creatures. It felt really nice walking on that new found clean sandy area, which was once the sea bed (not exactly but you get the point), looking into the puddles of water to find snails lugging around their shells and admiring the interesting designs on the sand created by sea weeds and the tiny beach worms swiftly moving around. 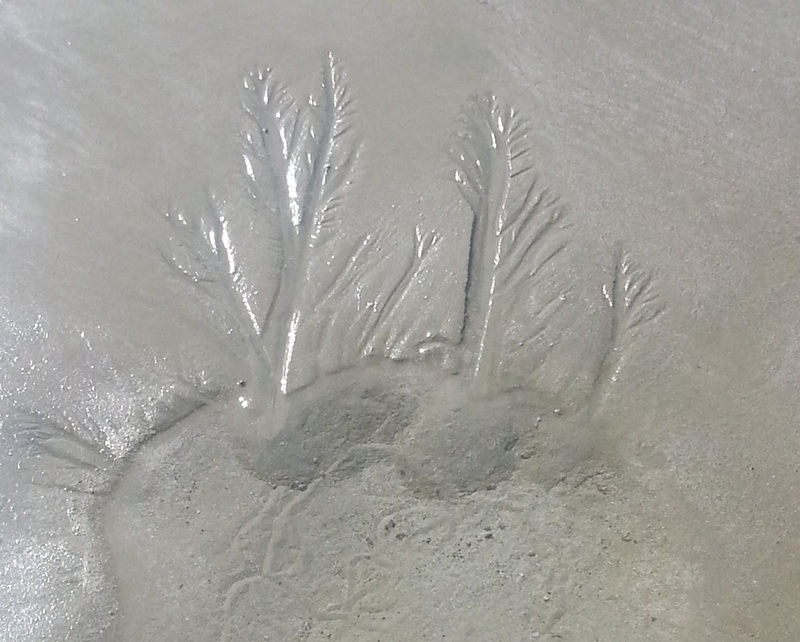 One of the several designs found on the beach! So, we reached the Playa Bonita Resort on Saturday afternoon, had a quick lunch at its beach facing restaurant (more about it later), checked into our ocean front room and ran into the beach - literally! Afternoon being the high tide time of the day, waves were at their best and I loved playing in the waters. Then, we saw the jet skis racing away in the waters and how could we resist them? We rented a jet ski for an hour and what a roller coaster ride it was with the rough sea and the waves - TOTAL FUN! We then decided that it was time for savoring chips and chocolates from our ocean front balcony. Now, how could we stop with just that? So, we decided to explore a Mexican restaurant in town for some authentic flavors. Exploring the town at night wasn't a great idea but after we finished the bowl of Molcajete at La Courva Restaurant (recommended with directions by our hotel concierge), we knew it was totally worth it. The dish is a must try, whether you love it or hate it! We loved it and would go back again, without doubt!! Satisfied, we called it a day. Next morning, after our beach walk, we had the breakfast buffet at the resort restaurant. With its perfect location and appealing ambiance, this ocean front restaurant is the best part of the resort. The resort itself is outdated and would have been called Hotel or Inn elsewhere in the US. But it was a last minute booking and we got an ocean front room, so no complaints! There were quite a few activities to explore such as para sailing, riding the banana boats, horse riding on the beach, going around in the cruise ships, but we decided to RELAX. With a beach towel on the sand and a kindle in the hand, I basked in the sun and finished reading a short novel ('The Metamorphosis' by Franz Kafka) with the beautiful sound of the waves in the background. A perfect lazy Sunday afternoon. This was my first time reading and sleeping on the beach - I thoroughly enjoyed it and looking forward to more! We followed it up with cocktails on the beach and were back in the waters unable to resist the temptation of the inviting waves. After dinner, we made a promise to get up the next day morning and run on the beach. And run we did, for miles at a stretch on the lovely beach (I alternately jogged and walked while my husband actually ran), marking an end to our rocking and relaxing vacation with a run. So, now you know that the road to relaxation is just a 4 hr drive from Phoenix! Another good news for people living in US with a valid US visa - You do not need a Mexican visa, all you need is a Mexican car insurance to explore this place! Why wait? Tip: If you plan to go there, we recommend staying in an ocean front room in one of the beach resorts on the sandy beach (Sonoran resorts seemed to be the newly constructed ones) and eating at the Playa Bonita Restaurant at least once during the day just for the views.